Neo-Hebrew poet and Russian translator; born in Wilna Sept. 27, 1848; removed later to Odessa. His first collection of Hebrew songs, entitled "Nite'e Na'amanim," appeared in Warsaw in 1869. In the same year appeared "Ha-Peraḥim" (Odessa), followed by "Nebel we-Kinnor" (Odessa, 1871), "Ẓippor Deror" (Odessa, 1872), "Ḳol ha-Tor," "Maḥat ba-Basar ha-Ḥai" (St. Petersburg, 1877), all poetico-satirical productions. 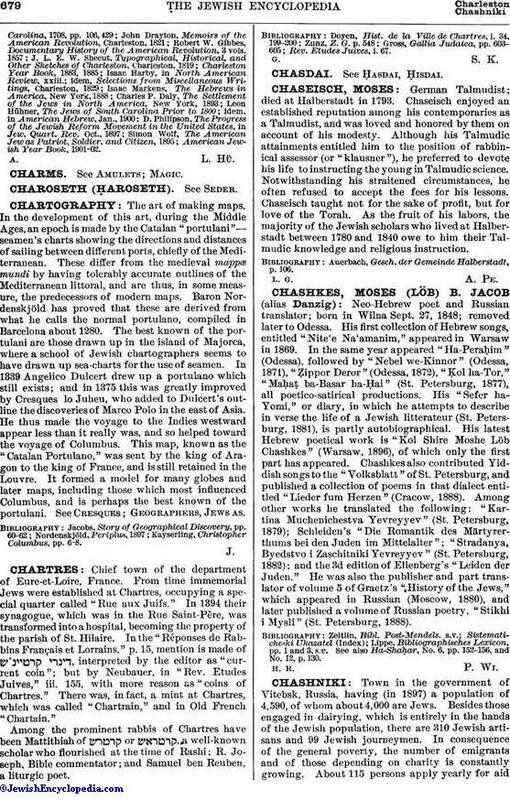 His "Sefer ha-Yomi," or diary, in which he attempts to describe in verse the life of a Jewish litterateur (St. Petersburg, 1881), is partly autobiographical. His latest Hebrew poetical work is "Kol Shire Moshe Löb Chashkes" (Warsaw, 1896), of which only the first part has appeared. Chashkes also contributed Yiddish songs to the "Volksblatt" of St. Petersburg, and published a collection of poems in that dialect entitled" Lieder fum Herzen" (Cracow, 1888). Among other works he translated the following: "Kartina Muchenichestva Yevreyyev" (St. Petersburg, 1879); Schleiden's "Die Romantik des Märtyrerthums bei den Juden im Mittelalter"; "Stradanya, Byedstvo i Zaschitniki Yevreyyev" (St. Petersburg, 1882); and the 3d edition of Ellenberg's "Leiden der Juden." He was also the publisher and part translator of volume 5 of Graetz's "History of the Jews," which appeared in Russian (Moscow, 1880), and later published a volume of Russian poetry, "Stikhi i Mysli" (St. Petersburg, 1888). Lippe. Bibliographisches Lexicon, pp. 1 and 3, s.v. See also Ha-Shaḥar, No. 6, pp. 152-156, and No. 12, p. 130.